Coins and Bullion: all characters can figure out the value of coins and ingots of precious metals, no rolls need to be made. Ordinary Items: any item that appears in the Gear Book likewise does not need an appraisal. If the players don’t know the value, it is easily discovered with minimal effort and no cost. Precious and Rare Items: other items must be appraised in order to get a value. The character must roll his intelligence or less on a d20 to successfully appraise a piece of loot. Each character may only attempt to appraise any one object, or group of identical objects, once. Furthermore, only certain classes are able to even attempt an appraisal, and they are often limited to only certain types of objects. Mystics, Druids, Healers and Berserkers are unable to appraise anything other than items that are specifically associated with their own class or order. Lackeys think everything is worth a fortune. SELLING LOOT: equipment looted from enemies can be sold for 50% of list price. Stolen goods can be fenced for 10% of list price. Thieves can add the higher of their Intelligence or Charisma score to the base 10% fence price. Equipment can usually be sold in large lots, all at once, taking a day of game time for the sale. SELLING GEMS AND OTHER FANCY LOOT: when characters receive gems, jewelry and other fancy loot, or decide to sell off magic items, they can dispose of them by travelling around the city state searching for a buyer in the market place or established stores. It takes 1 day per item to make a sale. For each item, the seller can attempt to make a good deal. For items that were successfully appraised, if he rolls his Charisma or less on a d20, he gets full retail for the item, if he fails, he gets 50% of retail price. If the item was not appraised, he gets 75% if he makes the deal, 25% if he doesn’t. Use the Hackmaster DMG for finding magic item prices. DONATING ITEMS: if a character donates a gem, magic item, etc., to an NPC cause (temple, monastery, poorhouse etc) he immediately gets the full value of the item applied as XP to his character. Arranging a sacrifice, is slightly different, splitting the XP between the PC and his future character XP bank. PURPOSE: I've been making various special treasures for decades now. However, it seemed like a complete waste of time. Everyone just "threw it on the pile", now a "500gp gem" isn't just a long way to say "500gp", it's a "small ruby" which is both a problem and an opportunity. The map certainly made a huge difference. 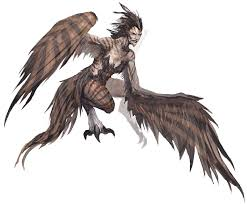 The fact that the map was so crowded really gave the harpies a chance. Their AC's were low, and hit points not exceptional, but the fact that it was impossible to bring the whole party to bear allowed them to hang on for a bit. The fact that Marlon was bedazzled a couple of time took out almost all the party's beef. Frank's o.k. and Ludwig doesn't seem to have a lot of punch yet. Having 2 bards spending all their time with buff songs seems to weaken the offensive punch of the party quite a bit. What's underneath the abandoned temple where the Morningstar Inn is built? How about looking for a special herb for Marlon's herbalist friend, that can only be harvested on the solstice (June 21) in the hag-ridden forest to the north? P.S. We need to start thinking about Mother's Day and the schedule.